In this book written with Jim Eber, Dan Negroni introduces B.R.I.D.G.E., “an overlapping and integrated six-step plan that unleashes the power of your inside-out work. It compels you to understand your own relevance to address disconnects and become completely relevant as a guide, mentor, and leader with and to millennials.” That is, those who comprise what is also referred to as the “Gen Y,” born (roughly) between the late-1970s and the mid-1990s. Today, their ages range from about 20 to 40. In fact, most of the material Negroni provides can also be of substantial value to the nourishment of those in other generations. The results of all of the major studies of customer values and aspirations clearly indicate that this is what has cross-generational importance: feeling appreciated, trusting and respecting supervisors and associates, believing in the value of the work they do, and the given employer is wholeheartedly committed to their personal growth and professional development. What is most relevant to millennials is also most relevant to everyone else. Yes, there can be – and often are – generational gaps in a workplace. They are perhaps most obvious when people who are 55+ are supervised by people in their late-20s or early 30s. Values and tastes differ, of course, but that’s hardly news. Almost 2,500 years ago in ancient Athens, Pericles complained about “insubordinate” and “wasteful” youth who do not respect their elders, wear strange clothes, neglect their studies, refuse to go to religious services, etc. It is no coincidence that companies annually ranked among those that are most highly admired and best to work for are also ranked among those that are most profitable and have the greatest cap value in their industry category. With rare exception, these companies have created and then nourished a workplace culture within which personal growth and professional development thrive. What’s their secret sauce? 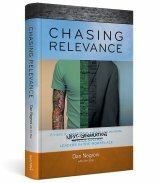 The cross-generation leadership development that Dan Negroni with Jim Eber explain so brillliantly, so compellingly in this book. Bravo!